Reliable assessments of crop growth and development enable accurate and timely management decision taking. Current machine vision and geospatial technologies enable objective, time flexible and cost-effective plant monitoring, although, little implementation has been achieved. 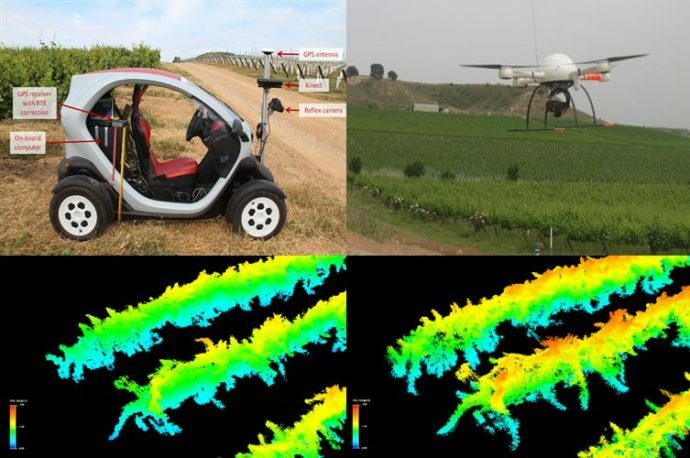 Aerial and on-ground vegetation characterization technologies are undergoing in continuous evolution. Aerial imagery use to be performed using an UAV equipped with different cameras. On-ground crop reconstruction is commonly performed using LiDAR-based measurements together with a RTK-GNSS or a new approach using depth camera sensors. Every technique provided a 3D dense point cloud from which several parameters such as crop volume or crop height can be calculated. The on-ground techniques use to provide the best details of the plants. However, the cost of acquisition use to be higher than aerial imagery. The use of 3D characterization technologies is showing promising results in current and future agriculture. It also needs to show its profitability at the current stage of development while reducing the inputs and the environmental impact of agricultural tasks.